Passmore Lowe, Frances. 1908. Orals, poem from the Bryn Mawr College Yearbook, Class of 1908. Bryn Mawr, PA: Bryn Mawr College, p. 72-73. Special Collections, Bryn Mawr College. 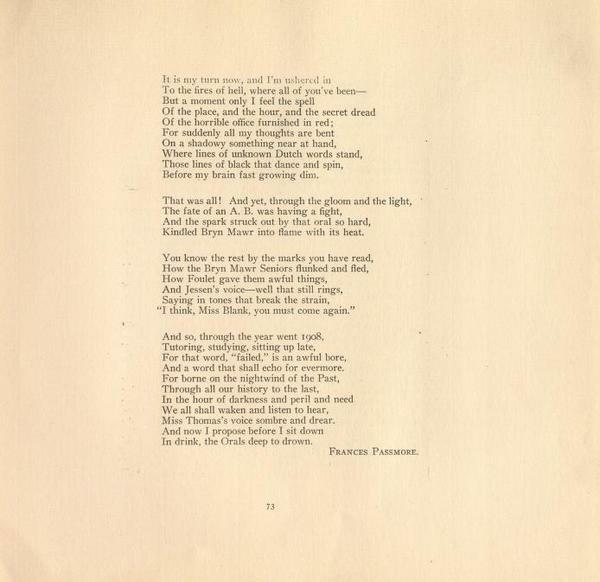 Passmore Lowe, Frances, “Orals, part two, from the Bryn Mawr College Yearbook, Class of 1908,” The Albert M. Greenfield Digital Center for the History of Women's Education, accessed April 26, 2019, http://greenfield.brynmawr.edu/items/show/1432.